The celidh season has passed and the weather has the air of impending autumn. The island though still has two treats in store, even before the October Festival brings an indulgent end to the season. September brings two richly contrasting pleasures to the island: the annual Colonsay Show and Ceol Cholasa, the island’s music festival. September is too one of the best months to see the flora and fauna of Colonsay putting on their own, natural show, before the days grow short and the nights grow long. 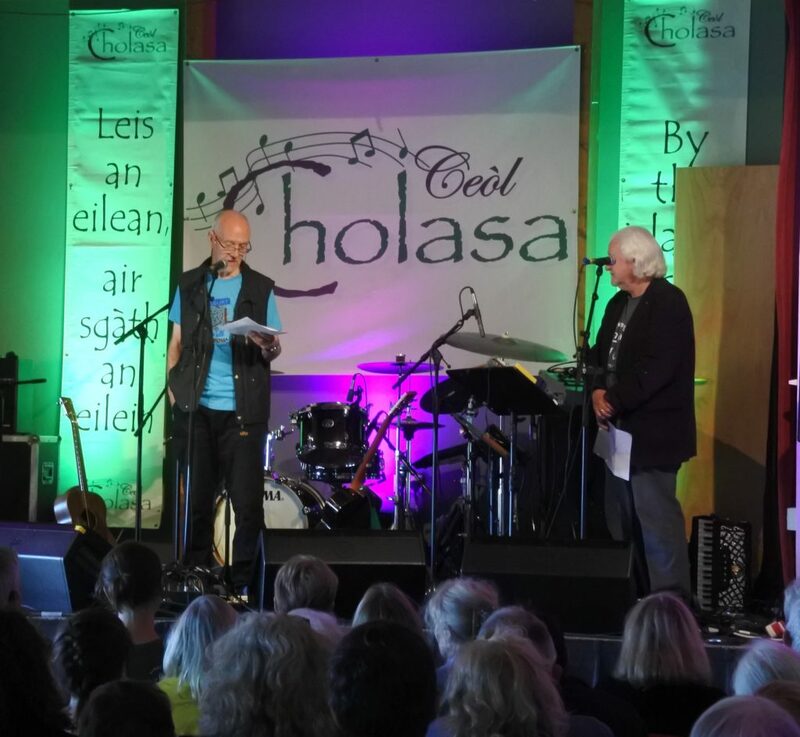 The 10th Ceol Cholasa was always going to be a special event and as the festival unfurled Keith Johnston and Pedie MacNeill served up an extraordinary celebration. Much-loved musicians made a return alongside up and coming performers who are the faces of the future, and there was diverse array of supporting events. A series of fringe events showed the depth and variety of what Colonsay has to offer, from food to poetry, as well as the ever joyous display of local musical talent. The extended festival ran from Tuesday 12th to Sunday 17th September, with fringe events filling the first few days and the main musical performances starting on Thursday evening. The scale was unprecedented with 19 concerts playing over the course of the festival. Each evening, late night sessions were hosted at the hotel, and for many these are the heart and soul of the Ceol Cholasa. At these sessions all are welcome and professionals and their public play side by side. Here the magic of the festival comes to life, and the vitality and joy of making music bursts out, even at 5 o’clock in the morning. 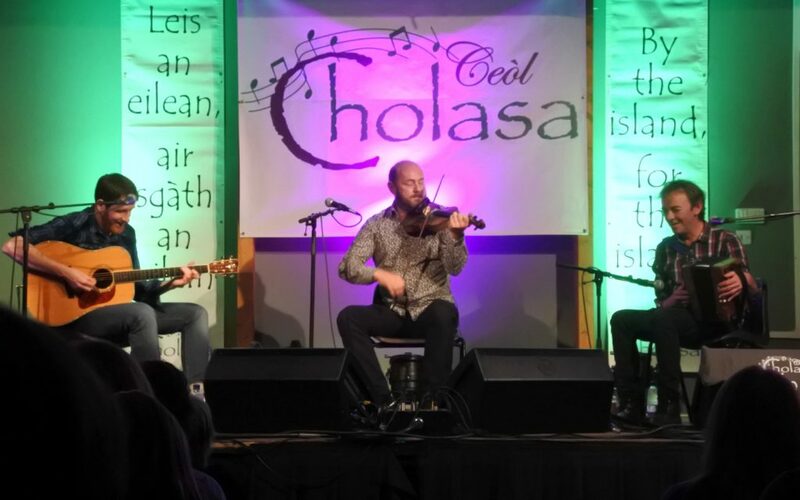 Returning faces from the first Ceol Cholasa included Kathleen MacInnes and also Rallion, who were the first band ever to play at the festival. One marker of the march of time was that Iain MacFarlane who had accompanied Kathleen MacInnes 9 years ago, now came with his own trio. 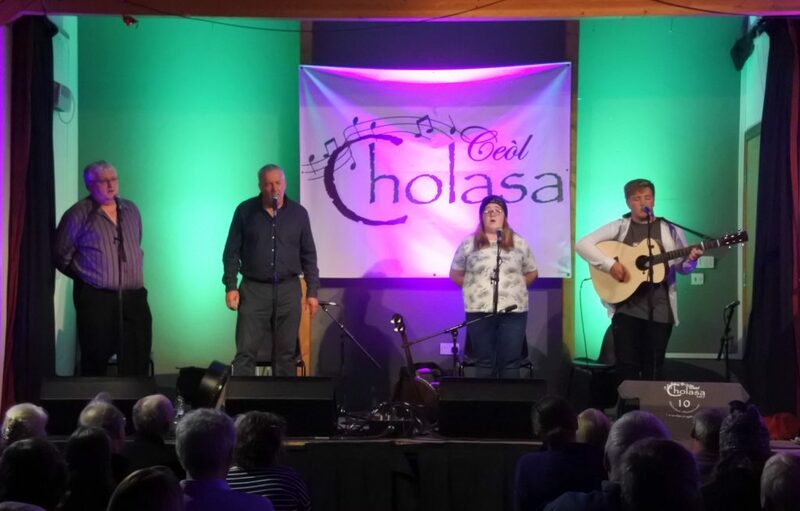 As much as the festival was about rolling back the years and celebrating the success of the first decade of Ceol Cholasa, it also showed the connection established between Colonsay and the musicians whose music and careers have grown and evolved over the years. One of the many successes for the festival is that the musicians enjoy returning and building their connection with the community and the many visitors who are drawn back year upon year. One of the festival’s greatest hallmarks is this fusion of professional musicians with locals and visitors. Colonsay’s own diverse musical talents were once again on display this year, with sets from Pedie & Jen MacNeill, the Machrins McNeills, and Keir Johnston. At the “Locals Showcase” the show was stolen by the children from Kilchattan Primary school delighting the audience and promising a bright musical future for the island. One of the highlights amongst the local performers was former Kilchattan Primary school pupil, Liam McNeill. The transformation of Liam over the last decade from a young lad with a drum to a stand out performer exemplifies another strand of the success of Ceol Cholasa. Bringing professional music to the island has inspired and enthused youngsters including Liam and his equally talented sister Caitlinn, whose banjo playing has been a regular Friday night delight at the Colonsay Hotel over the summer. The Machrins McNeill’s set where Liam and Caitlinn were joined by Seumas and Hughie, was a highlight of the festival. Amongst the professionals there was of course talent aplenty. The mighty Katharine Polwart Trio delivered a set to make the hairs on the back of your neck tingle and tradition met progression with both Inyal and Elephant Sessions providing outstanding entertainment to get people up on their feet. The return of Lorne MacDougall brought a smile back to many faces, while the virtuous playing of fiddler Ryan Young was a wonder. It is a testament to the effort and tenacity of Keith and Pedie that year after year they have managed to continue to bring such a high quality of performers to Colonsay. Sunday afternoon and the closing of the festival with a final stramash always brings mixed feelings: the end of the festival, a farewell to new and old friends, and this year a change of leadership. Naturally there with added farewells and many, many thanks to Pedie and Keith as the handed over to Keir Johnston and Liam McNeill. Something special was needed and was delivered. 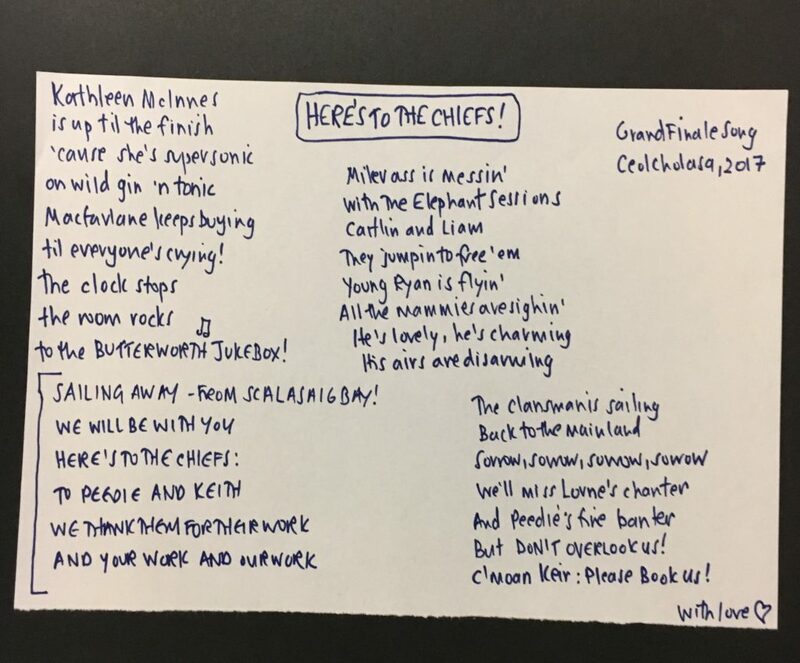 The stage crammed to bursting point with fiddles and fine voices, the finale of the festival was lead by Kathrine Polwort with a specially penned lyrics “Here’s to the Chiefs”, to the tune of Sunshine on Leith. This moment was beyond spine tingling. This was a moment to embrace and be carried away by the magic that Keith and Pedie have brought to the island. The Colonsay music festival is not as big as some but it has a pull for both musicians and audiences. This turns something small into something bigger, surprising in its wonder, and, fortunately for us all, enduring. The tunes and voices linger on the Colonsay long after the Sunday ferry has sailed away, this year with Lorne MacDougall piping hauntingly from the quarterdeck. Soon after, as the now empty hall was being cleared Pedie was deep in conversation with Keir, passing on the wisdom which will ensure that the Colonsay Music festival will remain an essential, vital part of the life of Colonsay. To Keith Johnston and Pedie MacNeill many, many thanks are due, and happily given. Early September sees the fruition of a year’s hard work in gardens, allotments, and poly-tunnels across the island. 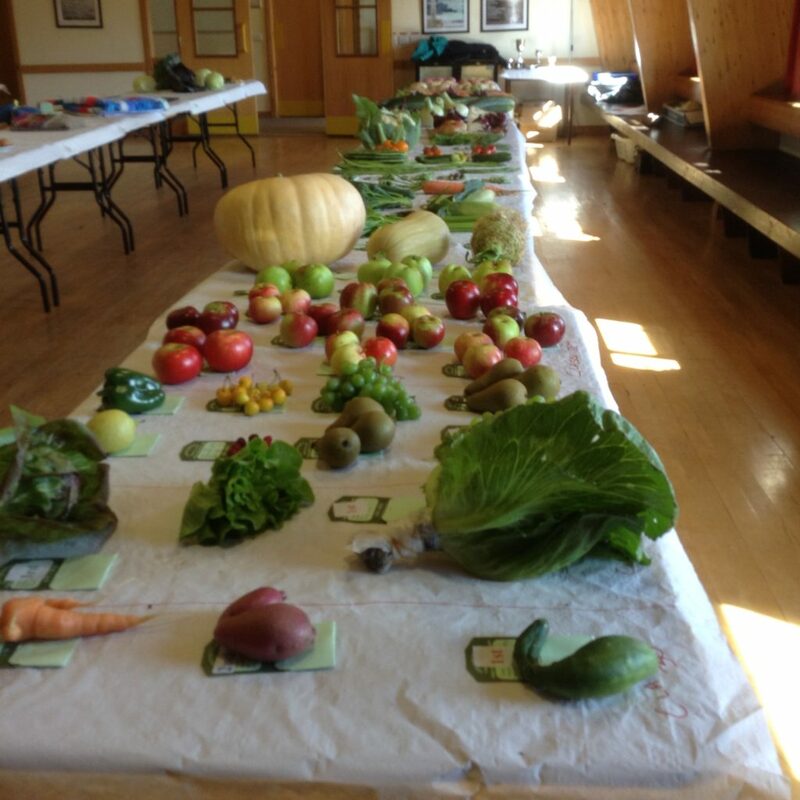 The Colonsay Show welcomes the fruit, vegetables and flowers produced by those with green fingers. 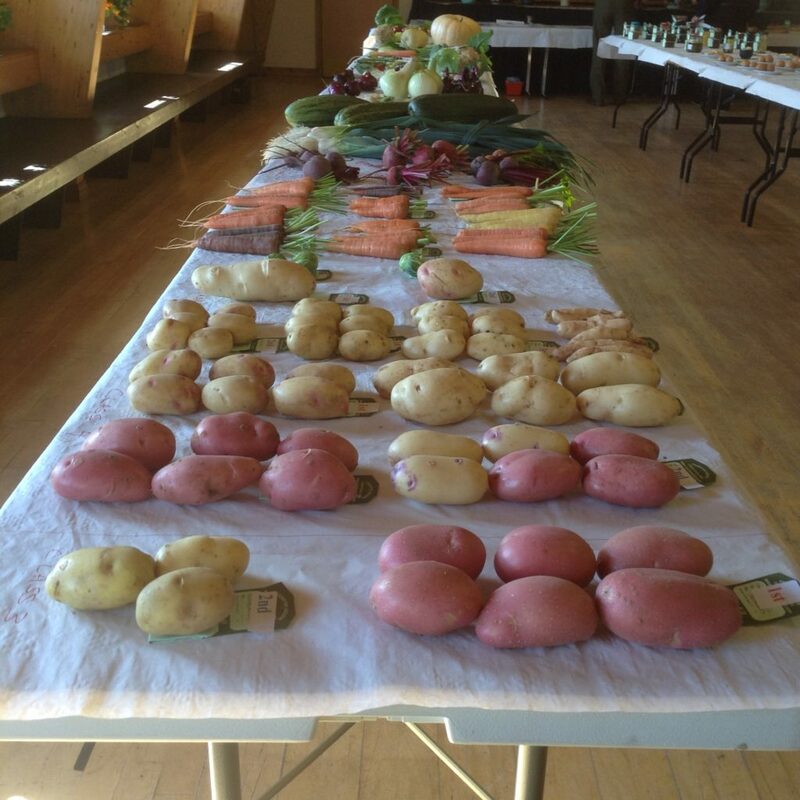 The Colonsay Show, which this year was held on Saturday 9th September, is about a much more than garden produce. It welcomes a wide range of skills and talents with show classes including bakery, art,photography, jam making and many more, alongside the main display of fruit and vegetables. It is a celebration of talents to delight all who have the pleasure of attending, with an added something special for those who win a prize, or the ultimate accolade of a trophy to take home for the coming year. One of the many delights of the Colonsay Show is to see even the youngest children on the island participating alongside their elders, and sharing in the pleasure of creating and sharing something which mainly has intrinsic, personal value. 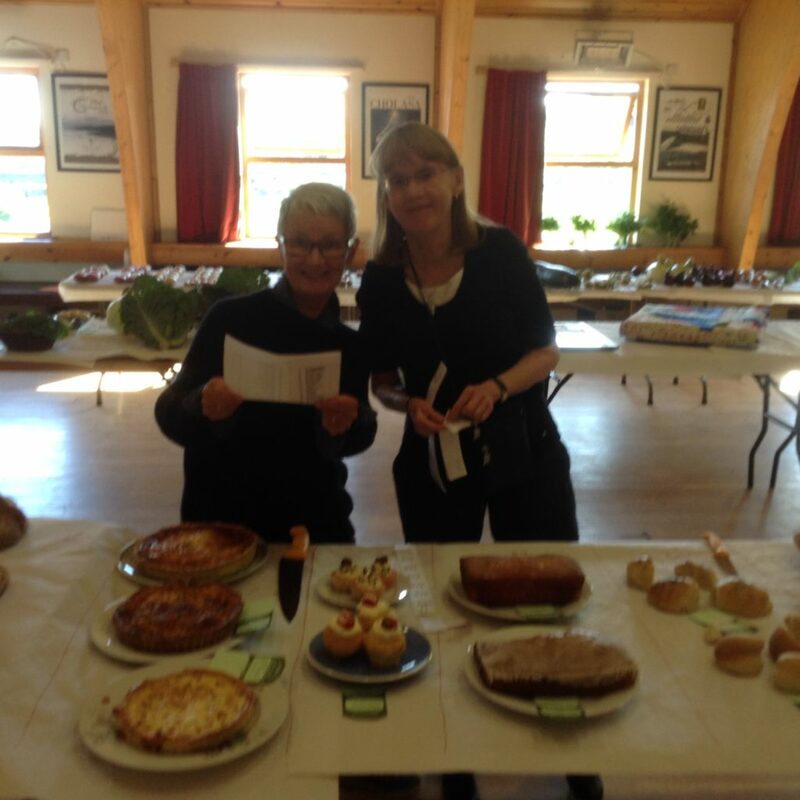 The Colonsay Show relies on the good-will, participation and contribution of many, and the hard work of a few, notably Rhona Robinson, and on the skill and endurance of the judges who this year were Hughie McNeill, Norman Hall-Gardiner, Heather McNeill and Margaret Third, who did well to find winners among such a strong showing of entries.